Veered off final and descended below tree line. A rush to conceal the tail number of the downed aircraft. 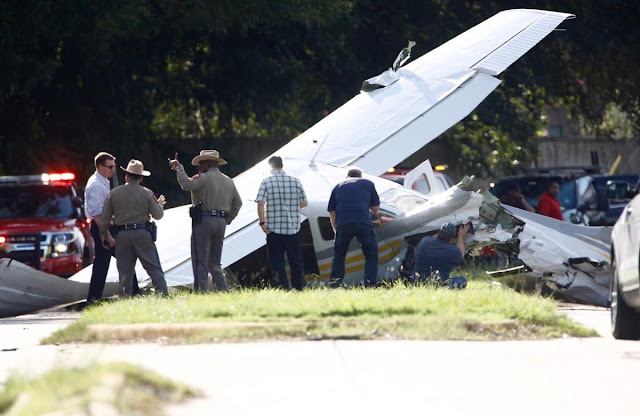 FORT BEND COUNTY, Texas - A small plane with three Drug Enforcement Agency agents on board crashed Wednesday near Sugar Land, according to authorities. 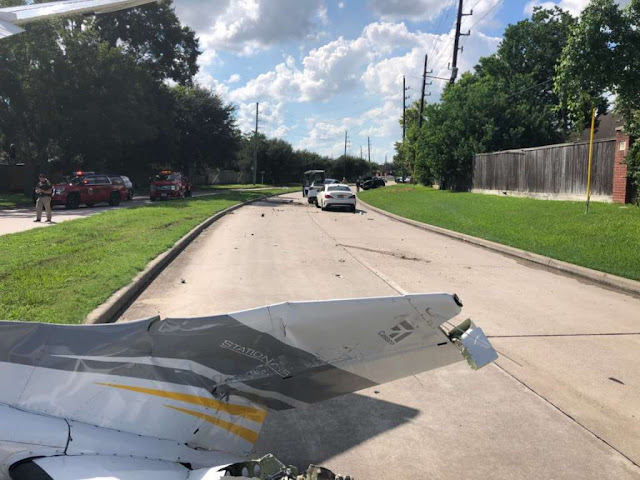 The government-owned single-engine Cessna went down about 3 p.m. near the intersection of Voss Road and Highway 6 while attempting to land at Sugar Land Regional Airport, according to a Federal Aviation Administration spokesperson. Authorities said the pilots were on a training mission and experienced technical difficulties as the plane approached the airport. Officials said two of the pilots were uninjured, and the other was taken to an area hospital for observation. Officials said the plane struck a power line and then at least two vehicles. Fort Bend County Sheriff Troy Nehls was amazed that the crash didn't cause more damage or injuries. "You look at the aircraft and say, 'Gosh, this could (have been) horrible.' I mean, look at the houses around here," Nehls said. "To be able to set it down right here and to be able to walk out of there (with only) minor injuries is quite an accomplishment." 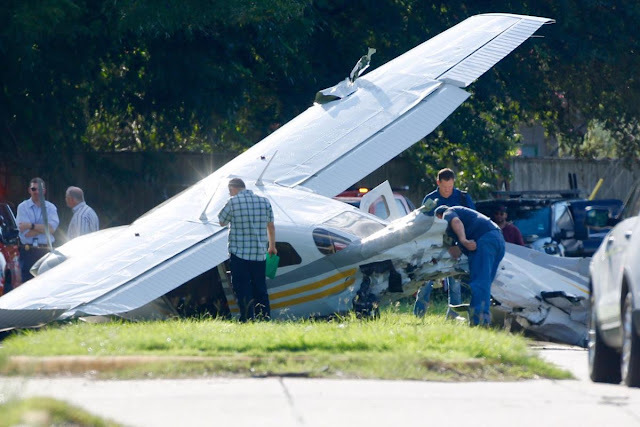 After the crash, the plane was leaking fuel, but no fire started. The people driving the vehicles were not injured but were shaken by the crash. "I really didn't know what to think. I just saw it and I knew this is it, either we're here or we're gone," Jay Camp said. A woman was forced to drive off the road in order to avoid the plane but was still hit by one of the aircraft's wings. "I thought, 'OK, I just need to get out of the way.' 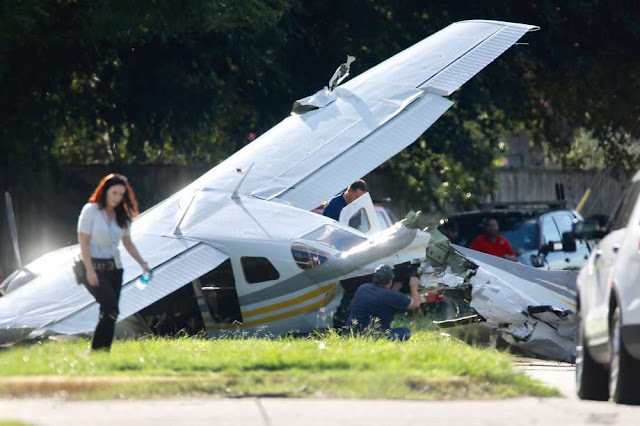 So I went to the right, jumped the curb and the wing hit us at that point," Terri Scheel said. Camp and his mother, Scheel, were in the first car that was hit by the plane. They were relieved once everything settled. "We both just hugged each other and said, 'Are you OK? Are you OK?" Scheel said. Camp was shaken up by the crash but was otherwise uninjured. "(I was) shaken up, and I look up and I'm alive. And I'm telling you right now, you can never tell me that there's not a God," he said. In the car just behind Camp and Scheel, O'Neil Kurup was driving, and his 3-year-old son was in the back seat. "We're always thinking to look out for the cars in the road, but not a plane from the sky," Kurup said. Kurup said after seeing the plane hit the first car, he had little time to react. "It was just swaying back and forth and within a matter of seconds, it hit us," Kurup said. Kurup is thankful they, too, are still alive. "I was thinking about my family, of course, and I didn't think we would come out of it because it was a plane," Kurup said. Both families agree that the heroic efforts of the plane's pilots kept things from turning out much differently. "He obviously handled it the best he could and he was successful, and we're really glad," Scheel said. "They were trying to avoid the homes and the roads are the safest place to do it, and I personally think that they did make the right choice. I'm just glad that all of us are safe," Kurup said. Residents in the area that witnessed the crash were going through their daily routine when the plane fell from the sky. 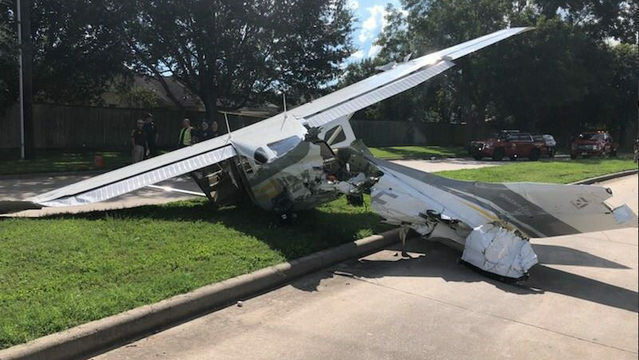 "I was actually in my backyard taking my dogs, out and a few minutes later, I caught a glimpse of the plane actually coming down," Alfredo Aviles said. Others said they were in awe that no one was seriously injured. "I had caught a glimpse of the plane coming down and I'm just, I'm just in awe like, 'No way. Is this happening?'" Alfredo Avilas said. "I've been living here like I said about 15 years. Yeah, you see planes coming by every now and then but this never happens." The crash happened near the airport, but people in the community were still amazed that something like this happened. "It's scary knowing that you're right next to an airport, for both the community as well as the person in the lane, or the people in the plane," Scott Germaine said. "That's a miracle. I'm glad for everybody involved that nothing more serious happened." The power was out in the area for a while after the crash, causing nearby Kempner High School to cancel a meeting. Another plane crash was reported about 5 p.m. near Houston Southwest Airport. The pilot was uninjured in that crash. 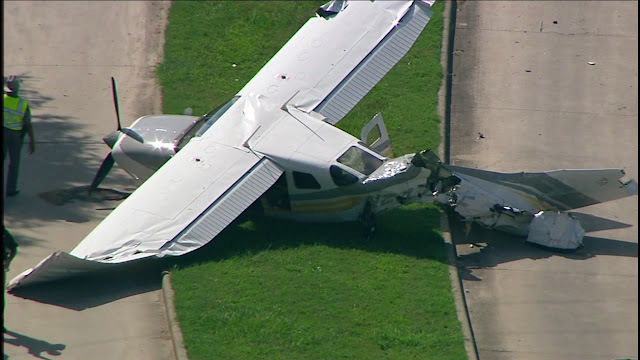 That telephone pole did a real number on the empennage. If it has hit the cabin things would have been much worse. 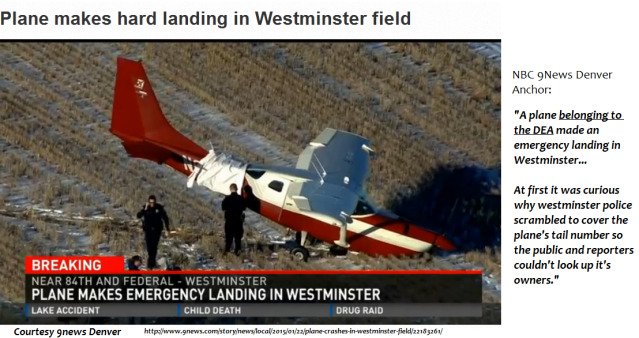 DEA plane paid for by taxpayers. Probably used to sniff out marijuana. Waste of money. It will be interesting to see the NTSB accident report. My guess is pilot error. Glad thier ok. I am also interested in what caused this. Maybe fuel valve selection? DEA has plenty of money, like CAP. Just keep paying your taxes. I would like to see The Wall Street Journal publish a list of all private contractors on the DEA aircraft they utilize, what they charged and what they did. Itemize it. 26 Cessna 206's registered to SILVER CREEK AVIATION SERVICES. A C300 and 4 helicopters. Hmmm interesting.